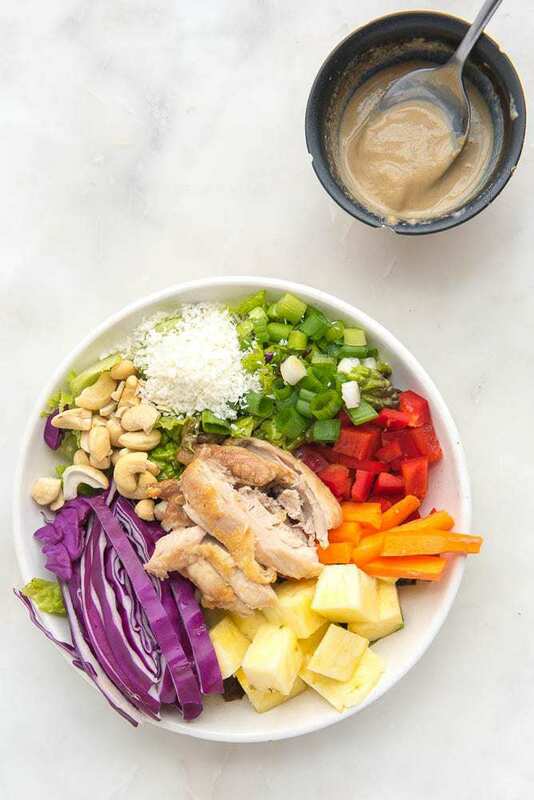 This filling Asian-inspired salad is Paleo, Whole30, gluten-free, dairy-free, and delicious! Wanna know one of the biggest reasons people can't follow those resolutions they so passionately make for the new year? It's not because they don't want it bad enough. Or because it's too hard or time-consuming. Imagine this scenario: You decide that this year you're going to eat Paleo 80% of the time. After trying out eating nutritionally dense foods and none of the processed stuff you've been feeling considerably better so you know this a resolution you want to make. 80% is also a good balance for you because you don't want to ALWAYS have to worry about what you eat and sometimes want a gluten-free baked good or some nachos when out with friends. You start the year off with gusto. The first Sunday you sit down and plan out your meals for the week, go shopping, and then cut up veggies for the week. You are excited. Everything goes great. Week 2, same deal. Look at you go! Week 3 you've got this all figured out, so you think of a few recipes to make in your head and buy the ingredients, but you don't do any actual planning. Everything still goes mostly ok.
Week 4 though… again you buy a bunch of ingredients from the store, thinking you'll figure something out like last week. Tuesday evening comes and your son's basketball game goes longer than expected. Your stress level rises as you scramble to think of things to make on your way home and thankfully get something onto the table in a reasonable amount of time. Thursday comes and your neighbor stops over to ask a question and winds up chatting for an hour. Then you realize dinner needs to be on the table and you have no idea what you're going to make. Again, the mad scramble to figure out a meal (and subsequent late dinner) causes your stress level to rise yet another notch. On Saturday you're out with your family and the time gets away from you, so you decide to just eat out rather than try to figure out what to make. When you get home you notice the sell-by date of the ground pork in the fridge had been that evening, so you throw that plus the quickly wilting kale you had purchased out. $15, wasted. You imagine throwing actual money in the trash and cringe. The stress level – plus guilt level, rises yet again. Eventually, after a few weeks of this, your stress rising to oppressive levels, you throw your hands up in the air and declare that boxed pasta, sauce, frozen chicken nuggets, and pizza are just SO much easier and less troublesome. Reverting back to your old, unhealthy ways just feels comfortable, like a cozy pair of stretchy waist sweatpants. Sure, you're sad that you couldn't do make the healthy thing work, but it obviously wasn't meant to be. Was the problem time? You might have thought so, but it really wasn't. You had time, you just chose to spend it on other things. Was it that you honestly didn't want to be healthy? Not at all! You still want to be, but think it's impossible. The real problem? You stopped planning. Planning is the keystone in all of this. It's the special ingredient that's the difference between success and failure. Between achieving your goals and wallowing in the pint of Ben & Jerry's after yet another failed diet. Often, the planning step is the easiest to overlook. The one that's passed by because it IS possible to eat healthily and workout without planning. Yet, without it, it's also the reason you stop eating healthily and working out. Your brain is so overworked and you're incredibly busy. Adding that seemingly tiny task of figuring out what to eat, especially in the heat of the moment, can tip the scales towards failure. I'm sure you agree it's much easier to eat out or throw a frozen meal into the microwave. Just knowing what you're going to make before mealtime can make a significant difference. As in the difference between you continuing to eat a healthy, nutritionally dense diet or a preservative-dense and nutritionally-poor diet that will continue to spark inflammation in your body. Unfortunately, meal planning can be hard work. If you don't do it correctly it can take up much more of your time than you're willing to give, and cause just as much stress as what you are trying to avoid. There are two ways to deal with this. One is to learn a quick tried and true meal planning system which allows you to plan your own meal choices. And another is to use a done-for-you meal plan that someone else put all the hard work and effort into making. Neither one is right or wrong. And both methods might work for you depending on what is going on in your life. The only way to know which one works best for you is to try them both out. If you want an easy way to check out a done-for-you meal plan, I have a free 5 Day Paleo Meal Plan you can download. Just click on the pic below to access the freebie library, where you can find this meal plan + tons of other free resources. I also have a 4-WEEK Paleo Meal plan available for purchase and instant download. It's only $9.99. One of the meals in that meal plan? This Asian Chicken Salad. It's a filling salad chock full of nutritious, colorful ingredients. You can also make this salad ahead of time so it's great for busy days! Plus, it's Paleo, gluten-free, dairy-free, and Whole30 compliant. I've included the recipe below, but the meal plan has lots of great meals like this. Don't let a lack of planning lead to drowning your failures in a pint of Ben & Jerrys. You've got this. I'm excited to hear about your success at the end of this year! This filling salad is Paleo, Whole30, gluten-free, dairy-free, and delicious! Preheat the oven to 425 F. Place a piece of parchment paper on the baking sheet. Lay the chicken thighs out on the sheet and sprinkle generously with salt and pepper. Roast for 40 min. Meanwhile, prepare all the rest of the ingredients (slice, dice, shred, etc). Make the dressing by placing all of the dressing ingredients in the blender. Once the chicken is done, chop it into bite-sized pieces. Place romaine/butter lettuce on plates and pile with all the toppings and chopped chicken. If serving now, drizzle with the dressing. Otherwise, store the dressing in a separate container and drizzle just before serving.